Devon Acres Organic Farm is a small farm located in Brant County, just west of Brantford and southeast of Paris. The farm is at the northern limit of the Carolinean Forest region in southwestern Ontario. They grow vegetables organically on about three acres, pasture sheep, cows and two Belgian workhorses on a good portion of the farm and have allowed and encouraged the growth of natural forest in some areas of the farm; in particular that portion along the northern boundary of the farm following the top of the well treed high southern bank of the Grand River. The forest in the upland areas of this locale would likely have been predominantly oak, hickory and black cherry with lots of american elm, basswood, and chestnut, some white pine, and beech as well. The lowlands and bank would have had a lot of birch, eastern cedar, willow, hemlock and maple (making a guess based on the evidence from the existing remanent forest around here). Devon Acres Organic Farm grow a very large selection of vegetables, and maintain a small herd of about ten to fifteen cattle for beef and a small flock of around fifteen to twenty sheep for mutton and lamb. The breeds of cattle are Canadienne and Shorthorn, and the sheep breed is Border Cheviot. They usually milk a couple of cows for milk for the house. The beef and the sheep are all grass fed, hay in winter, and are usually on pasture year round. Calves are brought into the barn each night for their own safety, and so that we can milk out the mothers in the morning. Calves for beef get no grain but we normally feed the milking cows a small amount of grain, usually crimped oats. The ewes get crimped oats starting about the end of September until just after lambing in late winter or early spring. 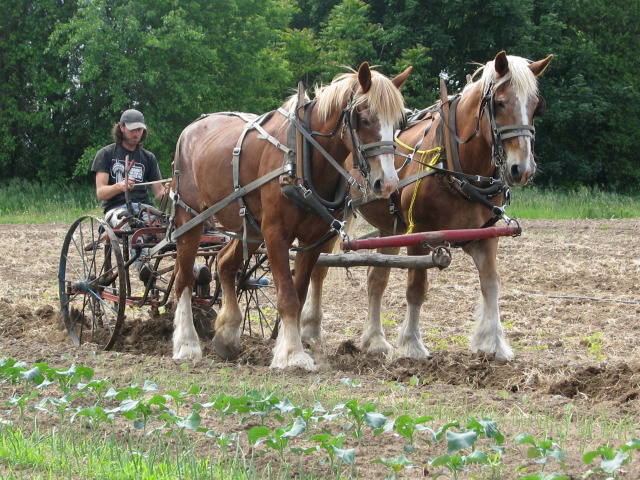 Devon Acres Farm uses its workhorses as the major power source on the farm. They do all the heavy work in the garden with cultivators, discs, plows and potato digger, and do a lot of wagon work drawing hay, firewood and other things as well.